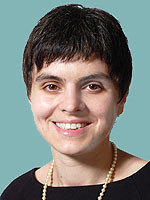 Dr. Anna Kozupa earned her medical degree from Wroclaw Medical University, Poland and completed her Internal Medicine residency at Cleveland Clinic Health System in Ohio and Bridgeport Hospital/Yale University School of Medicine in Connecticut. She completed a fellowship in Endocrinology at the National Institute of Health/National Institute of Child Health and Development, Bethesda, Maryland, and has been involved in clinical research. A member of the American Association of Clinical Endocrinologists and the Endocrine Society, she is board certified in Internal Medicine and Endocrinology, Diabetes and Metabolism. Dr. Kozupa provides specialty treatment for patients with conditions such as diabetes (management of the pump and Omni-pod insulin system), severe insulin resistance (treatment with U-500 insulin), gestational diabetes, adrenal disorders including Cushing’s, and women’s health issues such as Polycystic Ovary Syndrome, hirsutism, menstrual irregularities, loss of libido, bone health, and fatigue.